Mitsubishi Materials is proud to announce the expansion of our DF series solid carbide end mills. This line offers an economic choice for graphite applications. The DF line will offer 15 additional new items. Highly crystallized diamond coating is adhered firmly to the carbide substrate. Technological advancements have given us the ability to provide a high hardness coating with an economical price. Hardness is comparable to natural diamond. 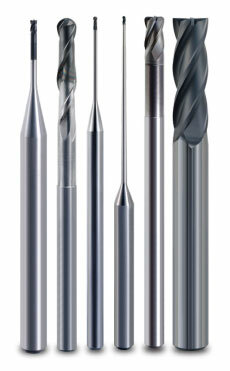 Seamless cutting edges on the ball nose and radius type end mills. Multiple geometries and a wide variety of sizes will meet our customers' needs. Highly crystallized diamond coating with high hardness will provide superior tool life in comparison to the competition. High adhesion strength will provide excellent wear resistance. Seamless cutting edges hold tight radial tolerances which creates excellent surface finish. First choice for graphite machining.